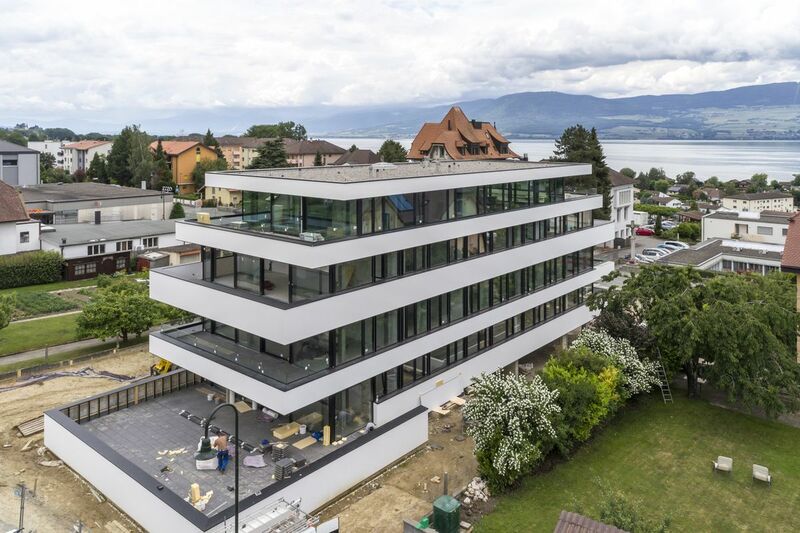 Residence Le 13 fits lightly into the homogeneous typology of the district, and is set at right angles to and set back from the Yverdon road, respecting the alignment and rhythm of the solids and voids that characterize the street starting from the historic city centre. 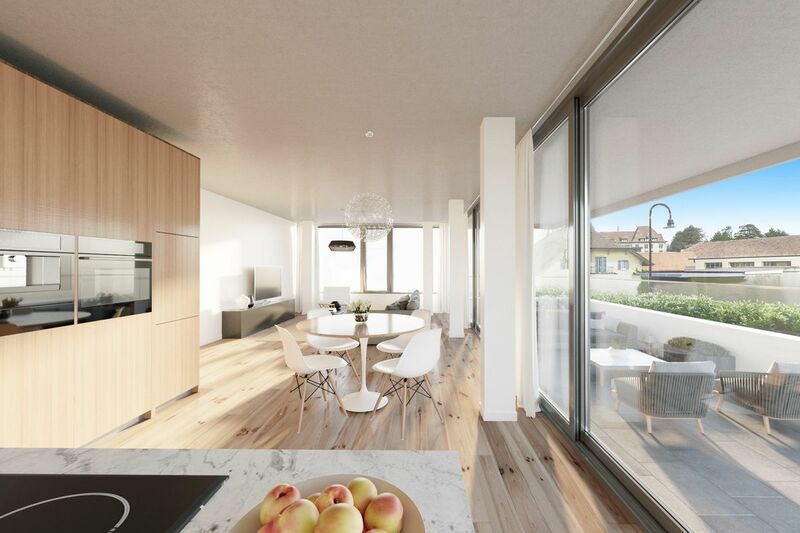 Thanks to the finesse of its architectural expression, Residence Le 13 integrates itself into the St-Pierre district with sensitivity and strength. The construction fully reflects contemporary developments, from the evolution of construction technologies to how we occupy our living spaces. The light, transparent and refined architecture marks the presence of the 21st century. The morphology and architectural expression of the volume reinforce the intention to integrate the project into its context. The staircase and lift serve two apartments per floor. The flexibility of the floor plan makes it possible to personalize each apartment to suit the tastes of the owner. On the ground floor, the apartments include a very large terrace and access to the garden. On the upper floors, each property also has a large covered terrace, and benefits from beautiful finishes. The entrance to the apartments is through a hall area with a built-in coat cupboard. On the east side, the master bedroom is pleasantly sized with a private bathroom equipped with a bathtub. On the west side of the apartment are two children’s bedrooms. A shared shower room with washing tower is located at the centre of the apartment. To the south the hall opens onto the living room, as well as the kitchen/dining room, which is oriented towards the large terrace. The entrance to the apartments is through a hall area with a built-in coat cupboard. On the east side is a generously sized master bedroom with a private bathroom with a bathtub, and two children's bedrooms. A guest bedroom and shared bathroom are located on the west side of the apartment. The hall is on the north side and gives on to a kitchen/dining room and living space which is organized around a hub comprising a separate toilet, washing tower and storage space; this in turn opens onto the large covered terrace. 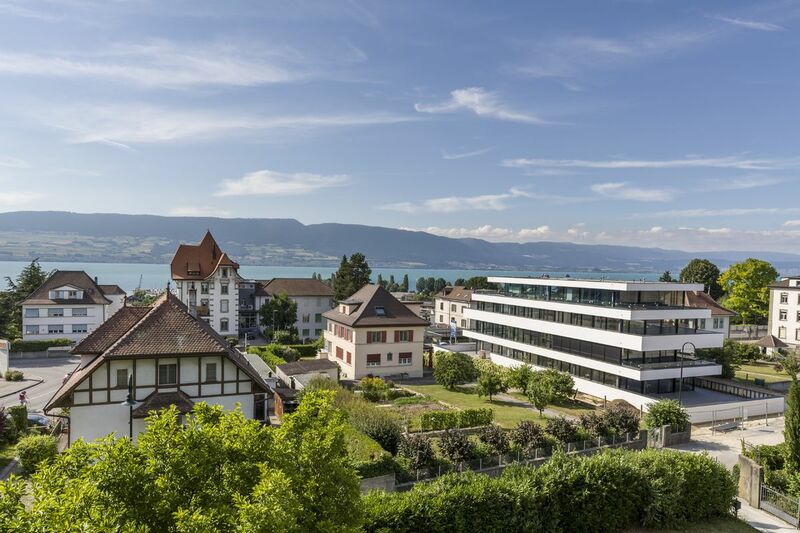 With its unbeatable view over the lake and mountains, the penthouse is one single apartment: a superb space of approximately 185m2. The lift and the staircase lead directly to the entrance area. 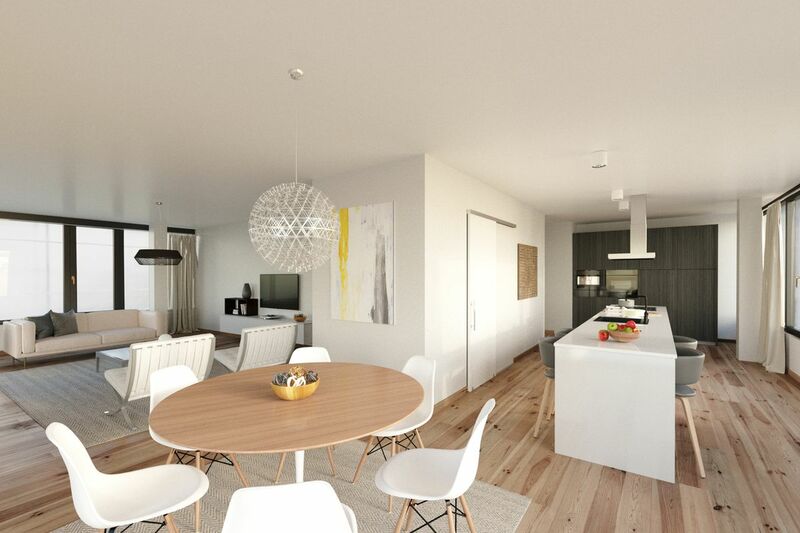 On the north side is the open-plan living space, including the kitchen/dining room. The cellar takes the form of a core that allows to privatized the shower room and the guest bedroom, compared to the day spaces. To the south, the parental suite and the office are organized in the manner of a free plan. The garage, open to the exterior, is accessible via a sliding gate which is in line with existing fences and walls along the road. It has 16 seats, 5 of which are covered. The entrance hall and the stairwell constitute the reception area of the building, which is spacious and luxurious. The walls are exposed concrete, the entrance doors of the apartments are walnut and the handrail with integrated lighting is black steel. The hall distributes the technical room and the individual and common storage rooms. As for the exterior courtyard, this is fully car-free and secured. 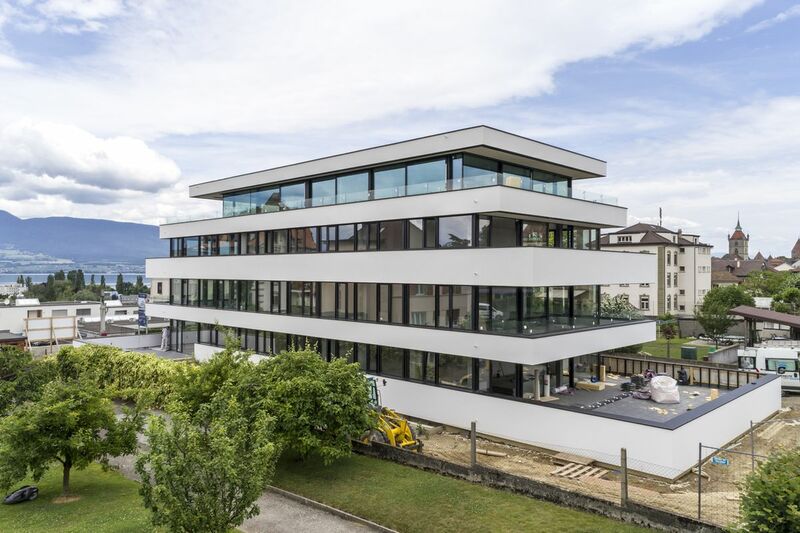 Designed by one of the leading architecture firms in the Fribourg canton, Virdis Architecture, and situated at the heart of one of most popular communes among natives of French-speaking Switzerland, Residence Le 13 is a high-class joint-ownership property with a contemporary architectural style. 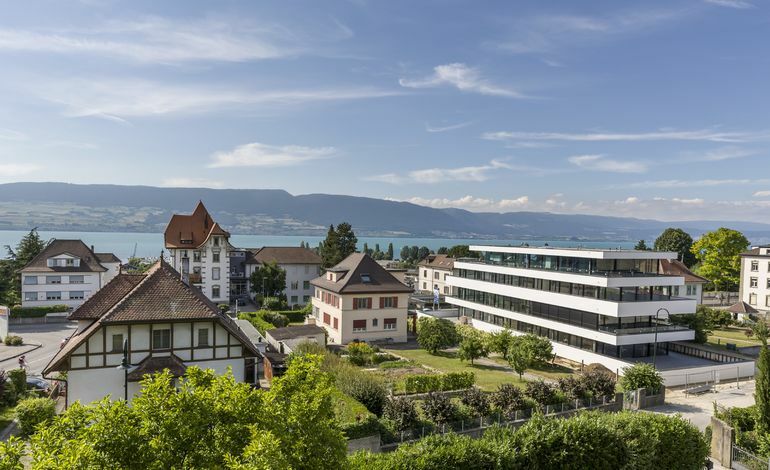 This new development, which offers breathtaking views of Lake Neuchâtel, comprises three apartments with 4.5 rooms, three apartments with 5.5 rooms, and a splendid penthouse apartment. All apartments include generous terraces. 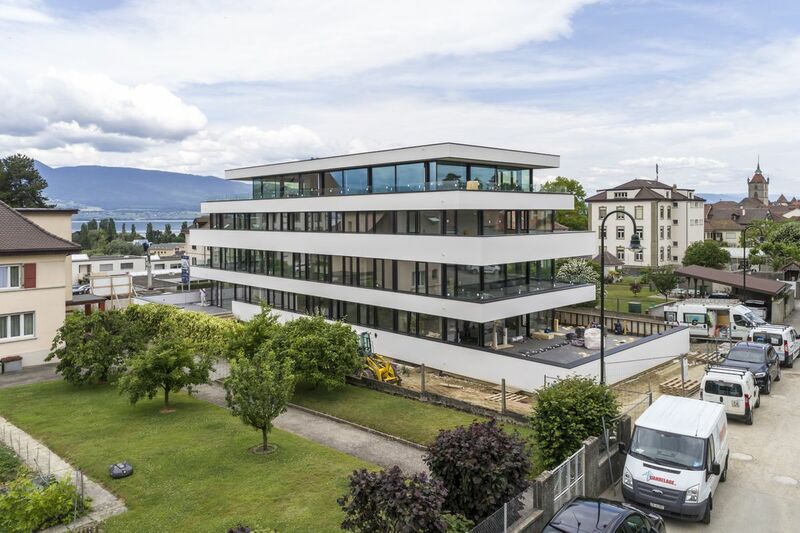 Residence Le 13 enriches and strengthens the existing urban layout, presenting a resolutely fluid and elegant design. Particular care has been to given to the interior comfort and environmental qualities of the building. 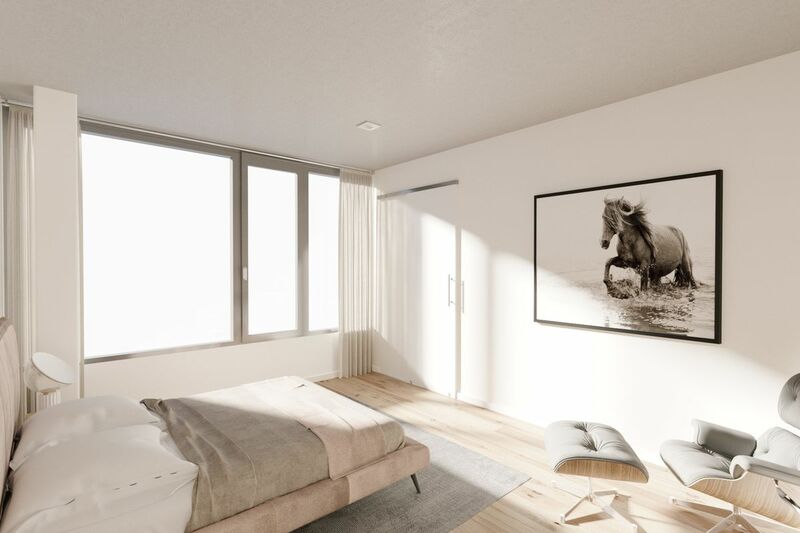 Heating is provided by a heat pump using a geothermal borehole, the heating distribution is via an underfloor system, and each room has its own thermostat for individual adjustment of the ambient temperature. In order to avoid overheating in summer and excessive heat loss in winter, the windows on the “long” façade (both fixed and tilt-turn) employ triple glazing. Protected by the overhanging balconies, the bay windows of the “short” façades are large double sliding windows. In terms of the construction, the slabs and the inner load-bearing walls are made of concrete.